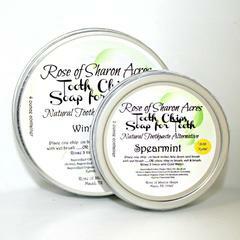 A natural herbal food combination to strengthen gums and brighten your smile. Benefical herbs historically have been used to help stop gum inflammation and separation, kill excess bacteria and strengthen gum tissue. This product works wonderful in combination with our Tooth Chips! Use Powder four times per week to brighten smile! White oak (Quercus alba). Strongly astringent white oak bark, used in a mouth rinse, is helpful for healing swollen, tender and bleeding gums. Myrrh (Commiphora spp.) is one of the best herbs for healing bleeding gums and mouth ulcers, and helps combat the bacteria that cause tooth decay and gum disease. Xylitol, a natural sugar made from birch trees, has been shown in studies to actually prevent tooth decay and gum disease. Thanks for Tasty Tooth Powder! What a surprise the first time I used this powder! I had put off ordering it because the last tooth powder I used (made my another company) tasted awful! I used it because I just assumed it was supposed to be that awful, and it was worth the bad taste to get the result. So I reluctantly ordered your product, and when I first used it, I was so happily surprised. It made my mouth feel so fresh and clean. I used it once, but then I decided that I must not have used enough. Maybe you have to use more to make it taste bad? It still had a great taste and left a cool, clean feeling in my mouth. Thank you for always making such high quality products!